Simulating the plastic injection moulding process reduces the need for costly physical prototypes, avoids potential manufacturing defects and helps deliver innovative products to market faster. We provide invaluable solutions to design companies, injection moulders and toolmakers. We have a dedicated team focused on improving the design and manufacture of plastic injection moulded parts, with a portfolio of industry-leading products to tackle any challenges. We help our clients select the best gate locations, identify the optimum processing conditions and study the filling parameters, checking if the mould has cooled adequately or excessive warpage has occurred. As a Moldex3D value-added reseller, we supply the automotive, medical, consumer, packaging and other industries involved in designing and/or manufacturing plastic products with leading simulation software. We recommend the appropriate technology to suit their requirements, enabling plastic product quality to be validated before investing in expensive tooling. 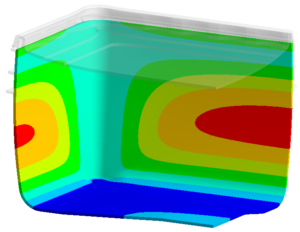 We provide flexible and fast-response injection moulding simulation consulting services to clients without the time, skills or resources in-house – from single day plastic design assessment to long-term product and mould development projects. Our services are typically employed to screen for and detect voids & sink marks, gas traps and weld lines with the objective to optimise fill patterns. 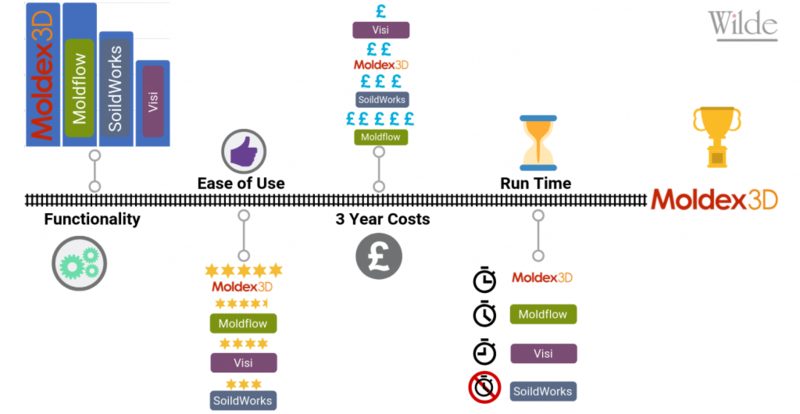 In addition to Moldex3D, we also provide Autodesk Moldflow training, consulting and certification services to support the entire plastics community. Our capabilities are internationally recognised through our status as an Insight Certified Expert & Authorised Training Centre. In addition, we can model plastic blow moulding and extrusion manufacturing operations through complementary ANSYS Polyflow simulation tools. Together with our Structural Analysis capabilities, we help ensure that any plastic component is Designed for Manufacture, balancing product performance in terms of strength, rigidity and fatigue life with minimum cost production. For fibre-reinforced plastics, our software can incorporate inhomogneous and directional material properties developed during the moulding process within design simulation studies of parts. The course was well structured and professionally conducted. Excellent course…..A fantastic refresher of key aspects of design for moulding, plus a gentle yet thorough introduction to the capabilities of the software. The course should be a requirement for anyone beginning plastics design. The basic principals of good design were clearly outlined, as well as an excellent introduction to the capabilities of Moldflow. Everything was explained clearly and comprehensively and I learned a lot... Good mix of theory and practical. Shown very many features and have good manuals to help me through in future. The course is well trained and I leave the course with lots more knowledge learned to take back with me in my new role... I had never used Moldflow before and will leave the classroom confident that I will now be able to perform Moldflow analysis with the aim of progressing to the next level very soon. An essential course for the injection molding trade. Well laid out and very easy to follow. Definitely recommended for injection molding/anyone working with polymers. A very useful and powerful [Moldflow] tool that should reduce the end-to-end design cycle. The guys at Wilde Analysis are very knowledgeable and passionate about what they do. I advise anyone needing analysis/training to make contact with Wilde. I thoroughly enjoyed my 3 days training and will be completing another course in the near future.